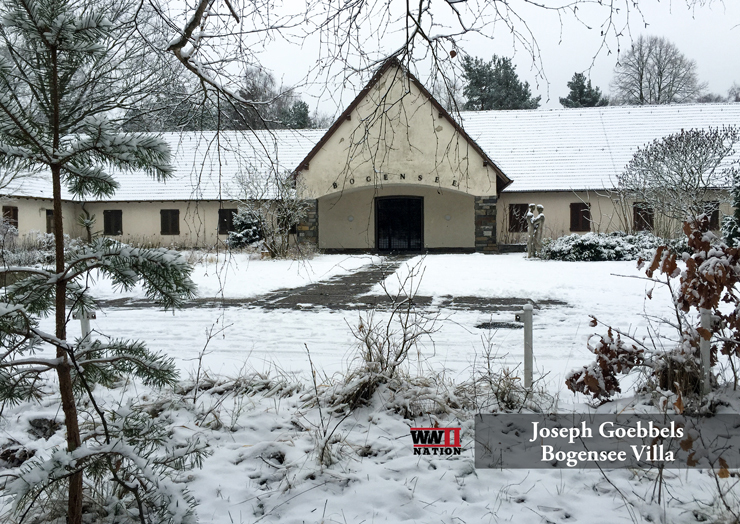 As many of you will have seen in our recent Berlin Vlogs one on the places Ross and I had been particularly keen to visit was Joseph Goebbels former country-retreat at Bogensee which is still standing to this day. Hiring a car for our final day of filming, we headed out of Germany’s capital in some very snowy conditions, in search of the Propaganda Minister’s former home. 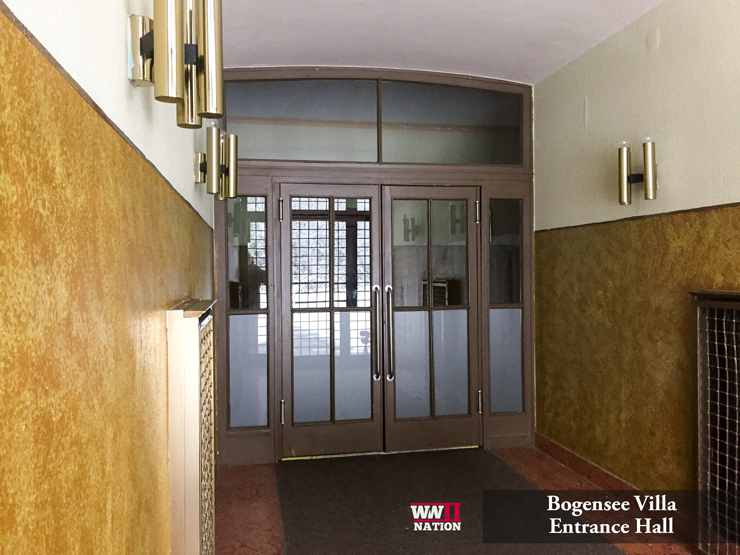 Bogensee was in fact 1 of 3 homes that Goebbels resided in, he also had one in Berlin on the Herman-Göring-Strasse as it was then known, and another lakeside house at Schwanenwerder near Wannsee. 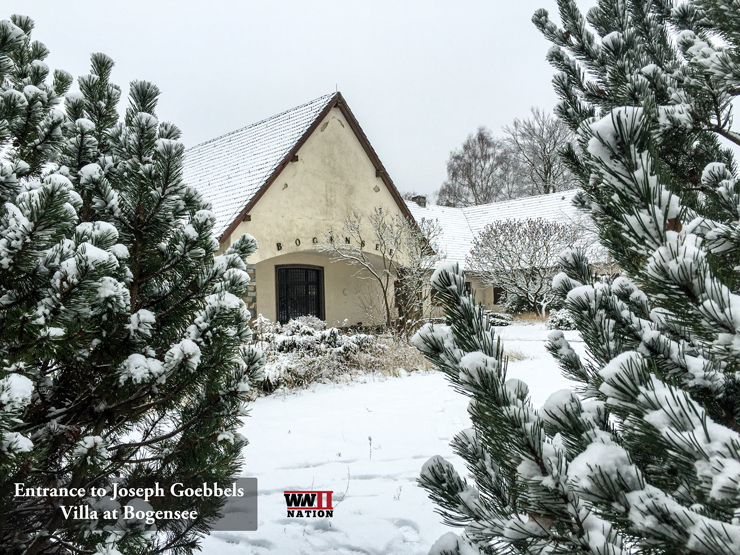 The Bogensee villa which is located north of Berlin, near Lanke, was a gift to Joseph Goebbels from the city of Berlin back in 1936 for his 39th birthday. Originally there was just a blockhouse and hut on the land opposite bow lake, but by October 1939 Goebbels had built a large country-house on the site. 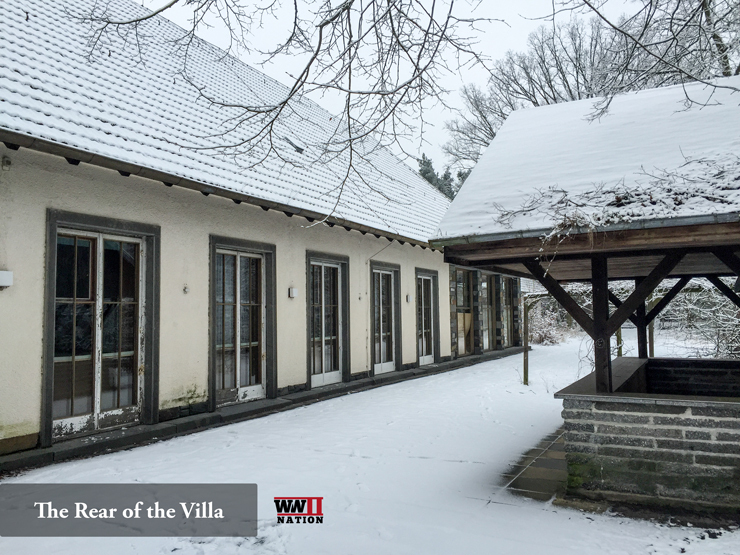 Its architectural style was said to be modelled on the Berghof, Adolf Hitler’s now destroyed Bavarian retreat. Equipped with over 60 telephones, the main house had around 70 rooms (30 private and 40 service rooms), it also has its own 100 square-foot movie theatre and a banqueting hall with open fireplaces and oak panelling. There are also electronic floor to ceiling windows for this room that at the flick of the switch descend into the floor and allows you to walk straight out onto the patio at the back of the house (pictured below – far right), which apparently still work today. Many of the original fixture and fittings from this time still exist including the marble entrance hall which we could just about see into. We did try the door handle, but unsurprisingly it was locked. There was also a number of outbuildings built nearby to accommodate guests, administrative staff and also garages for their cars. Interestingly the statue pictured in front of the entrance (below) was added post 1945, when the Soviets built the larger University complex next door. More commonly referred to as Lanke by Goebbels, he described his Bogensee retreat as ‘an idyll of solitude.’ It was his escape from the world, and very early on it was also an escape from his family, a place he could carry out his affairs, the most famous and public of which was with Czech actress Lida Baarova. They first met in June 1936 just before the Berlin Olympic games and reached its height in 1938 before Hitler got wind of it, and fearing that the Goebbels Family would split up ordered his Propaganda Minister to end the affair, which he duly did. 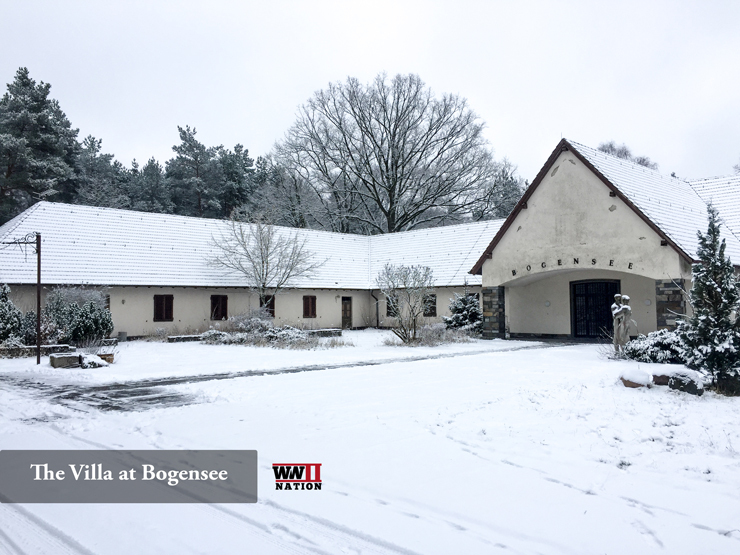 Following the onset of the British Bomber Command’s attacks on Berlin, Goebbels moved Magda and his children out of the city to join him at Bogensee (including other family member such as his sister and mother) as it was deemed slightly safer from the threat of stray bombs. The house at Lanke therefore became more of an official residence than purely country-retreat with his children being enrolled at the local school in nearby Wandlitz. 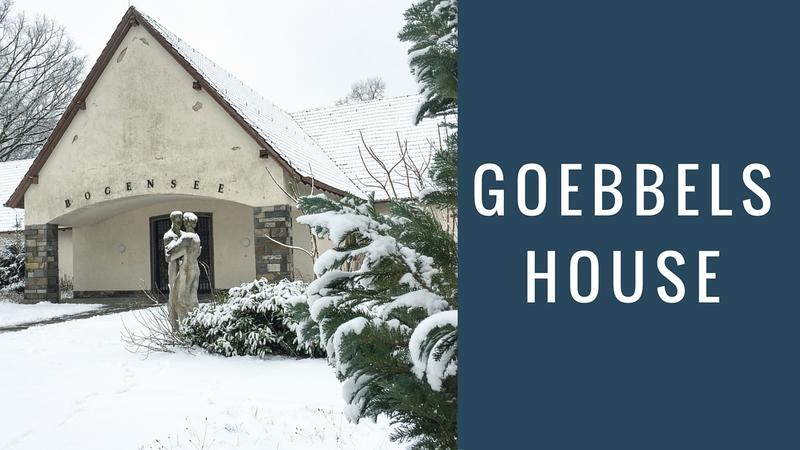 That being said Goebbels did still use his other properties such as the property in the centre of Berlin, but the threat of bombing which only grew as the war went on made it harder and harder. In late 1944 (I believe September) the house on the Herman-Göring-Strasse was actually hit by the bomb of a British Mosquito causing severe damage and preventing Goebbels from using the property for some time until it was made habitable again. 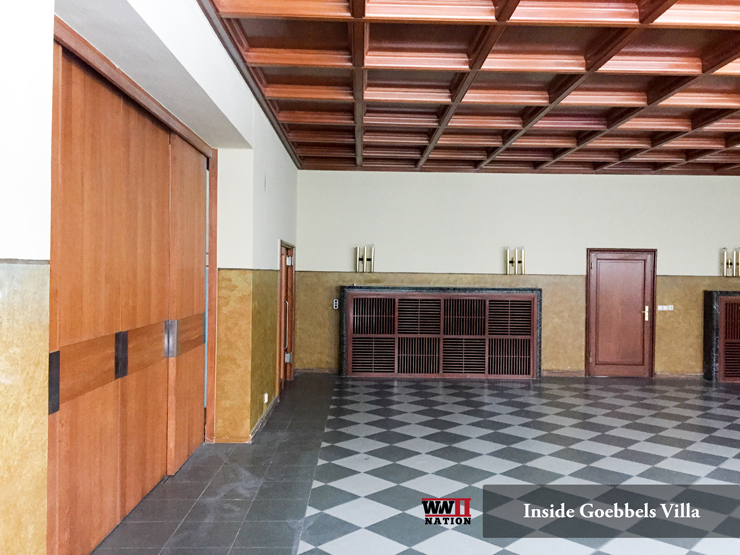 Goebbels would frequently come out to Lanke to write and carry out official party business, it was also here in his office that the Propaganda Minister compiled one of his most well known speeches on ‘Total War’ which he presented at the Sportpalast on February 18th 1943. 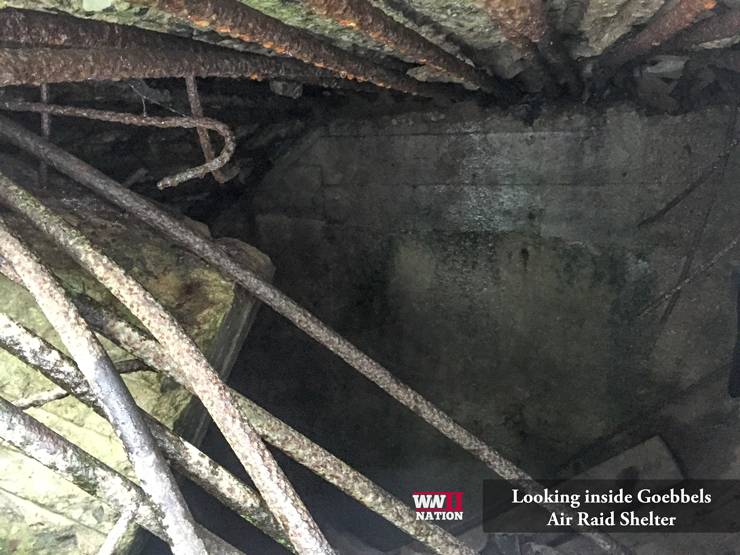 In 1944 the house and surrounding area was fitted with concrete air-raid bunkers to counter the increasing threat from the Allied bombing offensive, the evidence for which was becoming all too frequent. 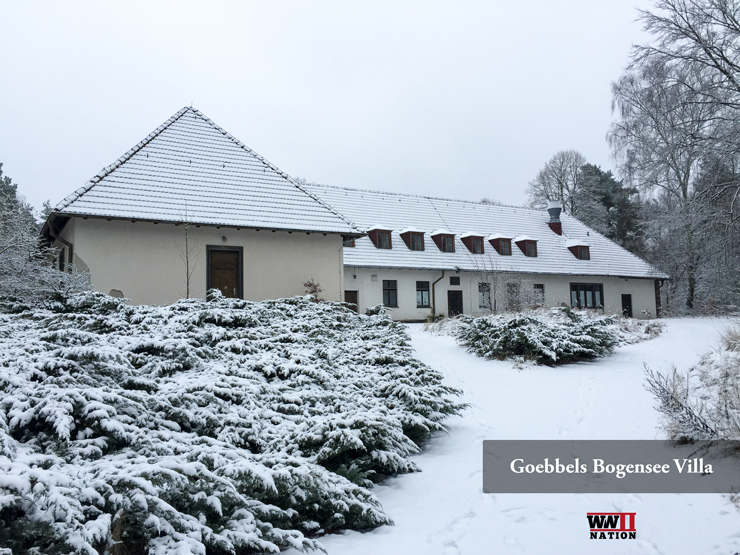 Goebbels frequently wrote whilst residing at Lanke about watching the air raids on Berlin by the Americans during the day then the flak at night as the British arrived. 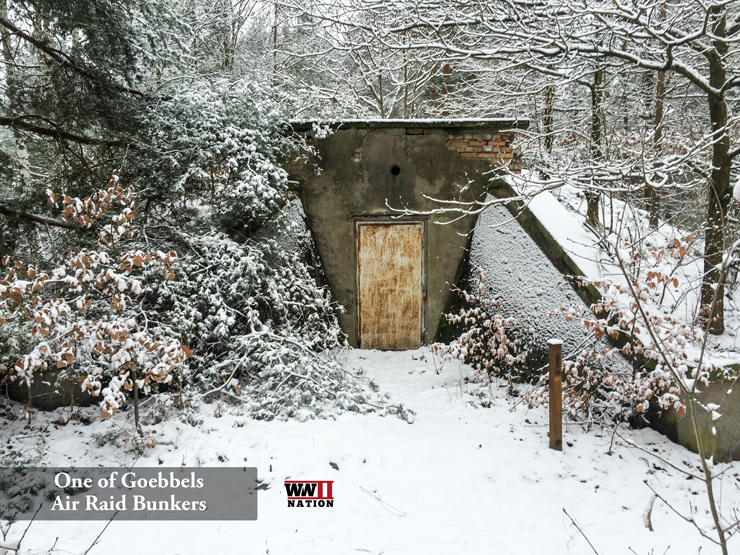 An underground bunker was built next to the house, an escape door and entrance that led to this was apparently located in Goebbels walk-in bedroom closest. 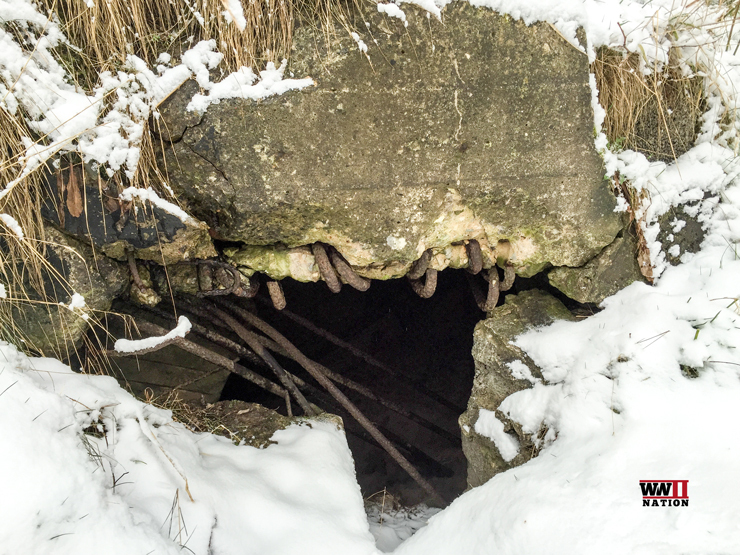 The bunker located just to the right of the house, was blown up by Red Army engineers after the war, leaving huge cracks in its concrete roof and sides which we were able to glance into. I also believe (I could be wrong and would appreciate if any one could advice) that there was another air-raid shelter which is located just out in front of the house [pictured above]. 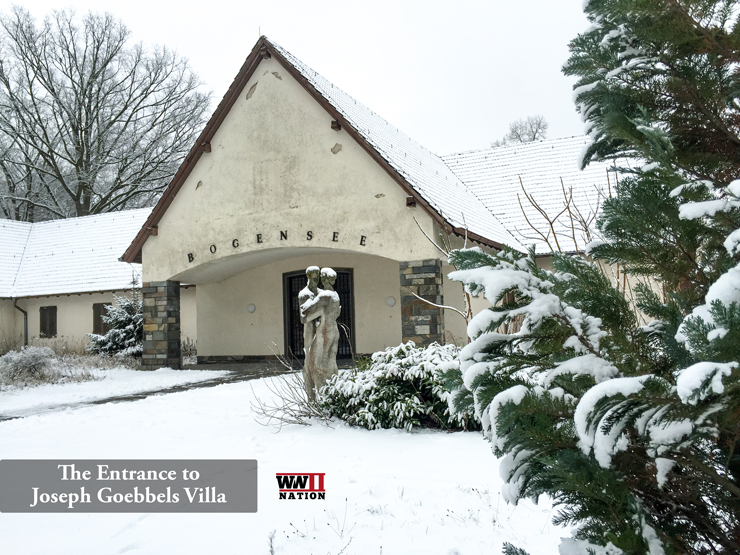 In April 1945, Goebbels and his family left the villa at Bogensee for the final time, moving back to Berlin and joining Hitler in the Führerbunker beneath the grounds of the New Reich Chancellery. 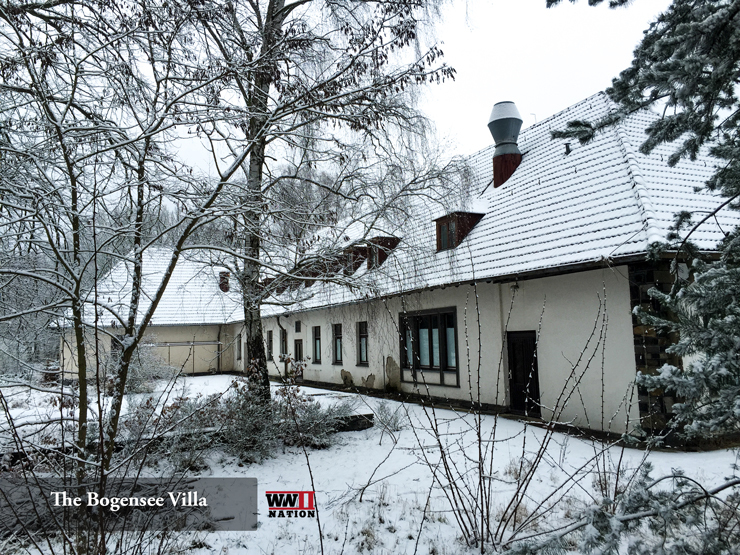 Following the war, the house was immediately used a military hospital then in 1946 occupied by the FDJ which was the Soviets youth organisation and turned the house into a youth academy. After 1951 a large 460,000 square foot Stalinist style university complex with 6 buildings was built on the land besides the Bogensee villa. Walking around this abandoned area today presents a very strange and erie feeling indeed, you can literally walk between two periods of history which are right next door to one another. 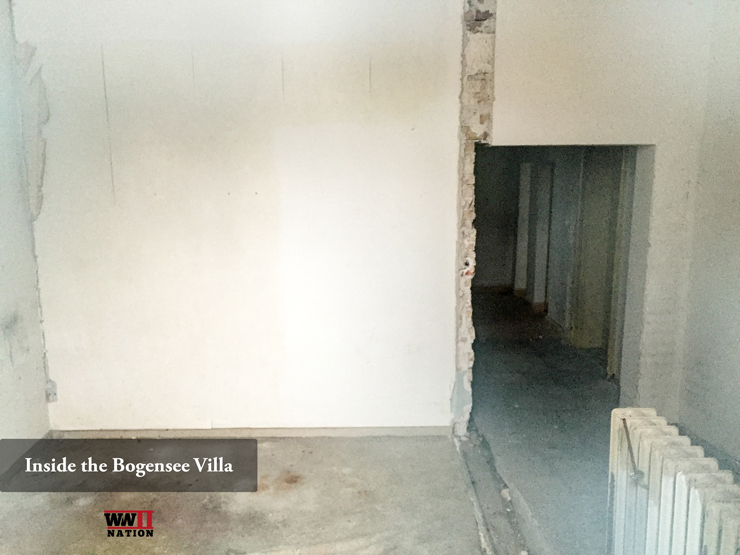 With the fall of the wall, Berlin took control of the Bogensee property and have been looking to sell it (along with the broader properties located around this site) ever since as it costs thousands each year to maintain all these properties. However they have so far been unable to find a seller and due to the historical significance and nature of the property they have unsurprisingly been very keen to ensure it is not sold to the wrong people for the wrong reasons. Last I read at the end of January 2016 they had in fact given up hope of trying to sell it. Hopefully you have found this post on what I have researched so far of interest and if there is any information that is incorrect I apologise. Please feel free to drop me a message below in our comments section if you have any further information. 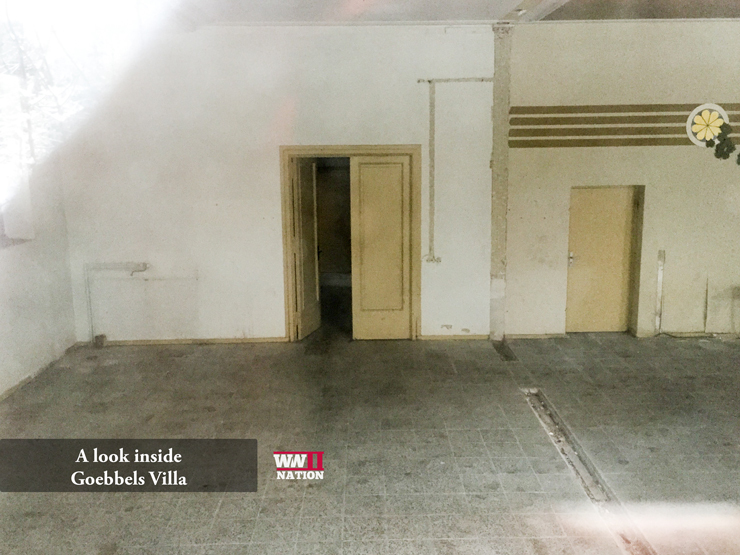 Click Here to watch our journey trying to find and also explore the Bogensee Villa in our final Berlin Vlog.